I played a lot of foosball in college. I wasn’t the best, but in a 2 on 2 game I was a darn good defender. We had a ton of fun, probably even more than the Xybots game cabinet that was in the same room. 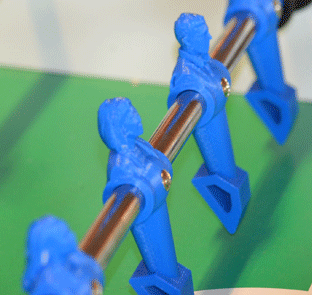 So I was pretty thrilled by this article on making custom foosball figures based on real people. One day I’ll probably buy a 3D printer. Until then I can enjoy the stuff others make with them. Thanks to Make magazine for the article and picture.